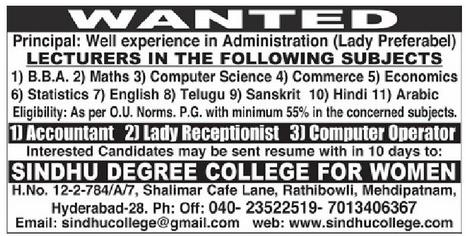 Sindhu Degree College for Women, Hyderabad has advertised in EENADU for the recruitment of Lecturer jobs vacancies. Interested and eligible job aspirants are requested to apply with in 10 days. Check out further more details below. About College: Sindhu College under the leadership of Sri.I.Rama Rao garu as Chairman was started in the year 2005. Within a decade of its establishment, the institution has made a remarkable tread in the field of education.